Although this is an automated message, it is written with heart - I love kites deeply, and I believe the KiteLife community represents this passion with a very friendly and helpful environment for everyone. Please feel free to browse around and get to know the others. If you have any questions please don't hesitate to ask. And while it's never an obligation, we always love hearing about our new members if you'd like to share some of your kite stories, videos, and/or background... Tell us a little about YOUR kite life! Hello all. New to this kite stuff but so far really digging it. Live on the Colorado plains and it's a rare day when the wind isn't moving. Over the last 15 yrs or so grand kids have come to stay with cheap kites . None lasted more than a day with much wailing and whining begging for another one. Didn't catch on until about 5 weeks ago. Three grand kids and two great grand kids came to stay with 3 hq eco line kites. Needless to say I didn't know a thing but did have the sense to read the instructions. Still they didn't make it thru the day. Once again the wailing , whining and gnashing of teeth commenced. The great grand daughter sounded just like her mom years earlier go figure. So I started doing some research to see if it was worth buying a better kite. Boy howdy I guess. Didn't have a clue about this sport. Hope I don't come across as a cry baby but here it goes. In 2012 I got t-boned by a 18 wheeler running a red light. It really hurt lol. Very happy to still be here. I still have spasms that knock me to the ground at times. Used to be constant but I am slowly improving. About 3 months ago Docs wanted to start physical therapy again. Doesn't work very well because the isolation of different muscle groups starts the spasms. So I walk till I'm tired. As I was researching kites I saw a post of a guy flying in a wheelchair. Light bulbs went off and I realized I could do this too !! What an inspiration. Many thanks to him. The kite makes me use all my muscles in unison and doesn't hurt so bad. Plus I'm thinking about the kite not me. If I ever see that guy I'm going to hug him. So after reading many posts of folks advising grow into the kite I got a Widow ng. Rob b is mostly to blame lol. The bug has bit though and I added an addiction and nighthawk. Haven't flown them yet. Yesterday I got a prism snapshot 1.4 sigh. Now I'm thinking about a hq fazer. I'd ask somebody to talk me out of the Fazer but this is probably the wrong place for that. Great to hear from you. Welcome to KiteLife. Most of your questions can be answered quite thoughtfully by expert masters like RobB among others. When I first got going on the kite forums I was somewhat inhibited by it all. Then a bit later amazed that top kite fliers were really willing to help someone like me. KiteLife is a friendly helpful place. We want to hear all about your thoughts & experiences. Many times new fliers have provided me with new insights. Equalizing the lines is very important.. I looks like you may have forgotten to re-tie the second knot..
@John Barresi's line equalization tutorial shows you how to not only equalize but also proper placement of the double knot.. If you didn't connect the lines to the kite properly with a larks head knot, you'll get the same disaster.. Have patience, you'll get it.. Welcome Breezin. Nice to see someone else from Colorado. 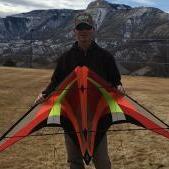 I live on the Western slope near Grand Junction if your ever in the area it would be fun to fly together. Hey, Breezin. Great to have you on board! 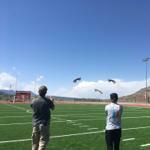 Kites are a great way to deal with taking your mind off the pain, and are a form of rehabilitation also. You move all parts of your body that you can and some that will surprise you in the morning, so don't overdo it the first few times out. I look forward to sharing a field with you someday. You rock @Breezin, I’m glad you’re here. Plus I'm thinking about the kite not me. If I ever see that guy I'm going to hug him. So after reading many posts of folks advising grow into the kite I got a Widow ng. Rob b is mostly to blame lol. The bug has bit though and I added an addiction and nighthawk. Thank you - I always enjoy a good story. Now I'm thinking about a hq fazer. I'd ask somebody to talk me out of the Fazer but this is probably the wrong place for that. Of course you are not going to get that "talking out of" here ! The following was true until very recently, the only kite that ever made me laugh loud is my Fazer XL. Used in a bit high and gusty high wind it is like a happy mad calf. It is reasonably trickable (though not sold as a trick kite), got a really large over steer (which is not the case of the Fazer XXL for some reason) and a gust might make you suddenly end three steps down wind. The kite is robust, so that higher wind when in the air you don't fear that it will break. Tip stabbing is another issue, then the robustness, the higher wind you are prone to choose for this kite and the mass of the kite becomes its enemy. When a LLE of the Fazer XL broke I reinforced the inside of the new tube by gluing a carbon fibre rod where the previous one had broken. Unfortunately I have no experience of the Fazer (called std.?) to share. Could only guess that it could be fun to try in high wind. Guessing anything when it comes to turns would be difficult, since the XL and XXL appear so different here. To learn and to learn to hold the fade. Found it lightly annoying that others seem to be quicker at learning this - this was actually good. Even though you wouldn't have any kiters around, if you can find someone that present a video of flying that is rather close to your level you can then chose to "race" against it. To let go of that your flying always need to look good - Hey, you need room for learning! Constantly be around those positions/situations where you want to learn and reduce the frequency of the parts that are already familiar to you. To myself I called it "tricking en masse" - an observer would probably have said "just tumbling around". Reconnect to the flares I already knew how to do since a long time ago, but in the flic flack context. Yes, once again the feet stopped moving forward when lightly popping the flare to start the transition to the fade, just as they did a long time before when learning other tricks involving a flare. Thank you all for the warm welcome. Sitting here looking out at 0 to 3 mph . Would be a great morning for sul I think. Glad I didn't buy the Fazer. That will be better served in the future. Don't think I need that kind of pull for now. Besides I still have to learn to breath then get my dance on lol. Going to save for higher end sul. From all I've read the niknak seems to be the best starting point ? Looking at my lines Ripstop was right. Thanks would have repeated next time flying and maybe more than that !!! Bought some rip stop nylon. Blazing speed up to 40 mph I hope. It's never going to end is it. Once you get a SUL you will look forward to the 1 to 2 mph days. I haven’t flown the niknak but have a Pro Dancer from Skyburner and it is amazing in light wind. I've been to the Skyburner site and did some coloring.Kinda like going to the Bentley site but more attainable for me. Broke lower spreader on my Widow this morning. I'll be calling them in the am. From what I've read and seen on video Pro Dancer is in my top 5. To soothe my bruised ego from the mornings tragedy I got a micron. I'll start saving tomorrow. Hit me up if you go to the Denver area kite meets. I'd like to see one in person. NO MORE KITES TILL SUL!!! Repeat as needed. Don't have a NikNak but have an iNak which is super close. Great kite. Well built and finished. I used it as my "no wind" dual. Good presence at the end of 20, 30 and 50 feet. Nice blend of tricks, precision and just flying around. If the NikNak is it's big bro, it will be a fun kite. In between Heaven and Earth, there are kites. Ha that's funny. Went to the Doc for real this morning and told them about my new about my new affliction. The nurse and P.A. were pretty concerned. There experience with kites is watching traction kiters in the snow and on the beach. Explained the different aspects of kiting and they concluded this will be a good thing. Told me my med intake better not go up and I said to much Tequila makes me stupid and fall down. Don't worry about it !! Got my snapshot 1.4 and Micron today . The Micron is the ugly orange one that I'll be able to see 100 feet away. Winds were blowing to fifty today. Blew some of the siding off the post office Glad I didn't get a Fazer. Would have tried it and then you know. More Tequila than advisable.